In the 30 second clip, the cop continues to nap as motorists drive by. 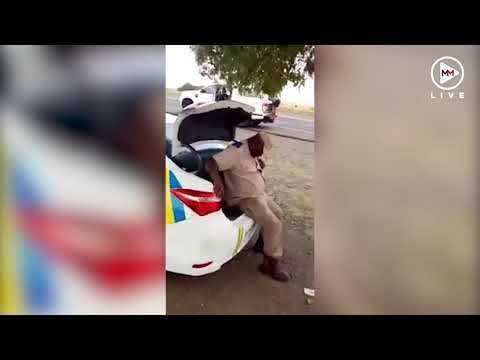 "He is on medication," the Free State department of police, roads and transport said in the wake of the video being spread. The car is parked under a tree with a high-speed traffic camera next to it. Department spokesman Hillary Mophethe told TimesLIVE on Wednesday that the incident occurred on Saturday, December 1, on the N1 north about 20km from Bloemfontein, towards the Verkeerdevlei tollgate. She said officers were doing a speed monitoring routine at the time. "The department has investigated the matter and can confirm that the officer is under medication for a condition that can't be disclosed. This treatment makes him drowsy, especially when it is hot, like it was on Saturday," Mophethe said. She said the officer was diagnosed with the condition in 2012. "He is a very committed officer with a very good history of employment in the department," she said.